"Words are insufficient. So I found another form of expression." Japanese author Yukio Mishima remains one of the fascinating, if aberrant, personalities of the twentieth century. Today most notorious for his 1970 ritual suicide in the manner of the samurai, at one time he was one of the most widely-read Japanese authors and was considered a favorite to win the Nobel Prize. 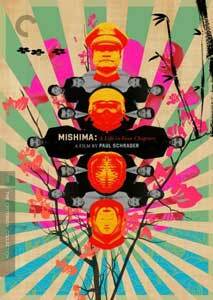 Paul Schrader's evocative and challenging biographical film about Mishima draws the man's life in bold strokes by incorporating episodes from three of his novels in a highly complex, but readily understandable structure. At the heart of the film are the events of November 25, 1970, Mishima's last day, when he, at the head of his private army, the "Shield Society," managed to take over a military headquarters, taking a general hostage in an effort to bring about the remilitarization of Japan and a restoration of the emperor to divine status. These segments, shot in naturalistic fashion, are intercut with flashbacks from Mishima's childhood, youth, and adulthood, which appear in black & white. Those three periods are echoed by excerpts from the novels Temple of the Golden Pavilion (representing the budding artist and his appreciation of beauty in the abstract), Kyoko's House (Mishima's fascination with the body, particularly his own, and bodybuilding intertwined with sexual fetishism), and finally Runaway Horses, an account of a 1928 rebellion within the Japanese military (prefiguring Mishima's actions on the final day, down to his death by seppuku). These are done in stylized color schemes and designs that set them off as highly unnatural, symbolic of the conventions and artifices of literature. Ken Ogata is riveting in the title role, conveying Mishima's charismatic nature as well as his insecurities that lead him down strange paths and eventually to madness. The cool confidence of the leader of the Shield Society is contrasted with the humiliated rejection after being referred to as "flabby" by a gay lover, which is itself echoed as he addresses the Japanese Self-Defense Force to jeers, hooting, and the paparazzi. The portrait is partially sympathetic and partially cold, complex and as deep as the man himself. Since Ken Ogata had largely been known for Yakuza thug roles prior to this film, his performance must have come as a revelation to those who expected little of him here. The segments from the novels are rather amazing in their visuals, which were conceived by Eiko Ishioku. They are on occasion realistic but more often than not are cartoonish or nightmarish by turns. The Temple of the Golden Pavilion is an explosion of gold and green; the bedroom where Osamu (pop star Ken Sawada) falls into a death wish with his Yakuza lover is an impossible structure of pink and grey, while the room of the conspirators in Runaway Horses literally falls apart like a house of cards. While not in the least naturalistic, they seem entirely appropriate for the subject matter and highlight for the viewer a delineation between fiction and what is represented as fact. At the same time, the excerpts are highly revealing of Mishima's thoughts and perspectives, with beauty-loving Mizoguchi (Yasosuke Bando) preferring to burn the Golden Pavilion, rather than let it fall into the hands of the West. The use of mirrors and sadomasochism in the second tale helps take us into the narcissistic and dangerous sexual excesses that Mishima often featured. And of course, the militaristic and fascistic themes of the third story are self-evident. Ultimately, however, they all reflect self-destructive tendencies that would bring about the author's undoing. One aspect of Mishima that gets significant discussion, but very little explicit screen time, is the writer's homosexuality. There is the brief sequence in a gay bar that sets Mishima off on a barrage of bodybuilding, but beyond that it's never referenced again. Yet his sexual preferences are implicit in much of what is seen, most notably the bullyboy trappings of the Shield Society with their Boy's Own blood oaths and solemn vows, interspersed with sniggering jokes. This is in stark contrast to the flashback of a wartime Mishima faking tuberculosis to avoid being drafted, a mark of cowardice that would haunt him forever. The sequences with the paramilitary squad show Mishima most at ease, among like-minded men, but more importantly, like-minded men who are willing to put themselves wholly under his sway. That leads to a larger question not answered by Schrader's film, if it is answerable at all. Clearly, Mishima was given substantial access to military bases, equipment, and personnel as part of his private army, and potentially could have wreaked major havoc had the Self-Defense Force been more sympathetic to him. So just how much of history is brought about by the insecurities, vanities, and neuroses of those with power? Image Transfer Review: As one would expect from a current Criterion transfer, the picture is first rate, with a detailed, crisp, and clear picture that's nearly high definition. There's no edge enhancement or other artifacting visible. It should, however, be noted for purists that Schrader has made some digital alterations to the picture (changing skies from blue to red, for instance), which he discusses in the commentary as being what he had wanted but which he was unable to achieve in 1985. Audio Transfer Review: Three audio tracks are presented here. The theatrical release narration in English by Roy Scheider is here, as is the guide track originally used for cutting the film. There's also a Japanese narration track by Ogata himself. The dialogue, however, is virtually all in Japanese. The soundtrack is clean and without fault, though it's not particularly directional. The music is by Philip Glass, and it may be familiar since it has been used repeatedly in trailers, advertisements, and even as the score to other movies (most notably The Truman Show). Glass' shimmering and ethereal score is indeed one of his most evocative and accessible, alternately martial and aspiring to something higher, yet always with an undercurrent of swirling darkness beneath. The music comes across well, without the strings ever being shrill or mushy. Extras Review: Criterion offers a packed special edition to this film, starting with a solid book of essays and notes, including an essay on the picture's banning in Japan and a series of striking photos that highlight the production design. A 2006 commentary from Schrader and Black Rain producer Alan Poul discusses the themes in-depth and in a chatty manner, though on occasion they get a little disoriented about where things fall in the film, which might suggest Schrader engaged in a good deal of cutting and recutting before reaching the final structure. It's quite informative. The only other extra on Disc 1 is an anamorphic widescreen trailer. Disc 2 offers some more substantial extras. Making Mishima (43m:52s) includes valuable interviews with Ishioku, Glass, and cinematographer John Bailey. They focus not only on the nuts and bolts of the making of the film, as the title suggests, but engage in a discussion of what it means for a writer to be portrayed as a person of impact. Producing Mishima (21m:58s) is a more hands-on set of interviews with producers Tom Luddy and Mata Yamamoto, covering the difficulties in getting the picture filmed, how George Lucas became involved and used the film as a bargaining chit with Warner Brothers, and the critical role played by Schrader's pregnant wife. The Japanese perspective is provided in an audio interview (25m:52s) with Schrader's sister-in-law, Chieko Schrader, who wrote the Japanese screenplay and to a large extent was both cultural go-between and effective director of dialogue scenes. Mishima biographer and translator John Nathan and friend Donald Richie discuss the man, his work, and his beliefs, which gives a pretty good overview and indicates just how difficult but rewarding such relationships could be. Mishima on Mishima (7m:05s) is an excerpt from a 1966 French television interview with Mishima, who is asked some fluffy question about the role of the writer in modern Japan and French influences on his work. Nevertheless, it's important to see the real man talking about his art. Finally, there's The Strange Case of Yukio Mishima (55m:06s), a 1985 BBC documentary on the writer's life and death, which is indispensable for the bare narrative facts about Mishima. Alas, the package doesn't get the highest marks because of what's omitted. The deleted scene, which is referenced in the commentary and which appeared on the previous Warner DVD, is missing here, as is the documentary Inside Mishima from that disc. There's a good deal of overlap between the Warner commentary by Schrader and this one, so it's not a serious omission. However, Schrader also references other materials, such as audio of Mishima's final speech, which are also unaccountably absent. There's a bit of the newsreel footage of that day seen in the BBC documentary, but there's clearly a good deal more extant and not present here. A complex and endlessly fascinating portrait of a complex and endlessly fascinating man, with an attractive transfer and a ton of extras.